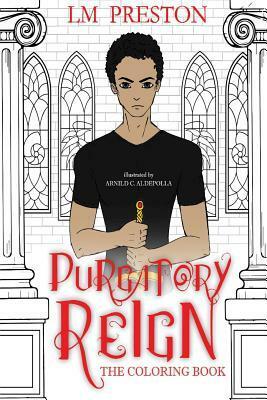 The illustrated coloring book was designed by Arnold Aldepolla based on the Purgatory Reign Series a Young Adult, Urban Fantasy novel series Purgatory Reign which includes: Purgatory Reign, Deviant Storm and Fierce Tides by LM Preston. Peter Saints' life stinks. But things are about to get much worse. First, his parents are murdered in front of him. Then another victim dies in his arms. Visions plague Peter with warnings that something wants him for a sinister cause. It desires the one thing that Peter refuses to give, his blood. Peter carries within him the one gift or curse that could unlock a secret to destroy the human race. On the run with Angel, a scruffy kid, Peter starts to unravel the mystery. It is the one treasure the heavens sought to hide from the world. Unfortunately, when Peter finds the answer he hopes that will save the girl he loves, he opens the door to a great evil that happens to be salivating to meet him. Purgatory Reign series includes Purgatory Reign Deviant Storm, Fierce Tides and Colliding Souls. LM Preston is a the author of Purgatory Reign series and Arnold Aldepolla the illustrator and artist who created the coloring book based on the book series has several other works with ranging from various genres.